The damages caused by the flash of heat and blast were aggravated by subsequent fires. These leveled neighborhoods where the blast had inflicted only partial damage. 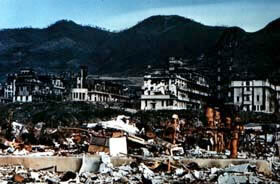 In total, 12,900 houses were completely burned or destroyed and another 5,509 were partially burned or destroyed. The fire also increased the number of victims. Many people trapped under fallen debris had suffered only external injuries but died as the fires raged through the city. About 800 meters south of the hypocenter. The lush roadside trees in this quiet residential neighborhood burned to ashes. The explosion had completely buried the road in rubble. 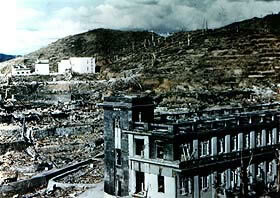 About 600 meters east-southeast of the hypocenter. 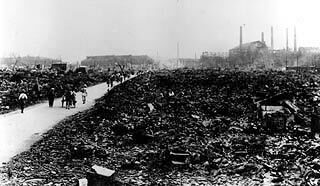 Except for a few reinforced-concrete structures, the buildings to the upper left were completely destroyed and burned. The building to the lower right is the Nagasaki Medical College Hospital.